No matter who you voted for, I think we can all agree upon the collective relief this country feels now that every waking moment will no longer be filled with political ads. ‘Romney hates babies!’ ‘Obama wants the terrorists to win!’ …. Really? SOOOO Glad they’re over! 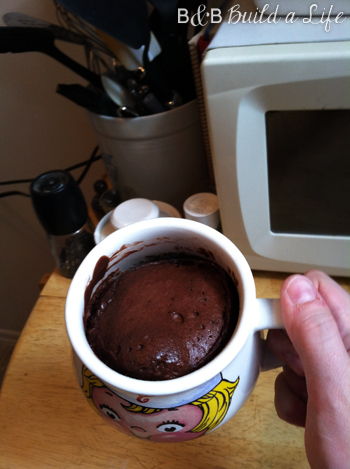 In honor of this end, I decided to share with you my experiment trying to make comfort food – microwave brownies with hot cocoa. I learned afterwards that this apparently was not a new idea, and actually my process went very similar to the one Crafty Mom 101 took. Let me show you. Start by melting the butter, then whipping in the cocoa mix and egg. A regular fork works great. Then add in the flour til you get a pancake batter type consistency. Ahhh yes, warm, chocolate aromas should now be coming from your microwave (to mask the stale popcorn butter smell) and you should have something like this. Drizzle a little more chocolate syrup on top and dig in! And in less than 5 minutes (including prep time and digging around in your pantry for flour) you have this tasty treat warm and ready to eat! Not too shabby! Have you found any creative ways to use hot cocoa packets? We have a huge stock of them so any new ideas on how to use them (other than the obvious hot chocolate beverage) would be a great help!